For my third and last old remnant, I found these buildings that look ripe for demolition. 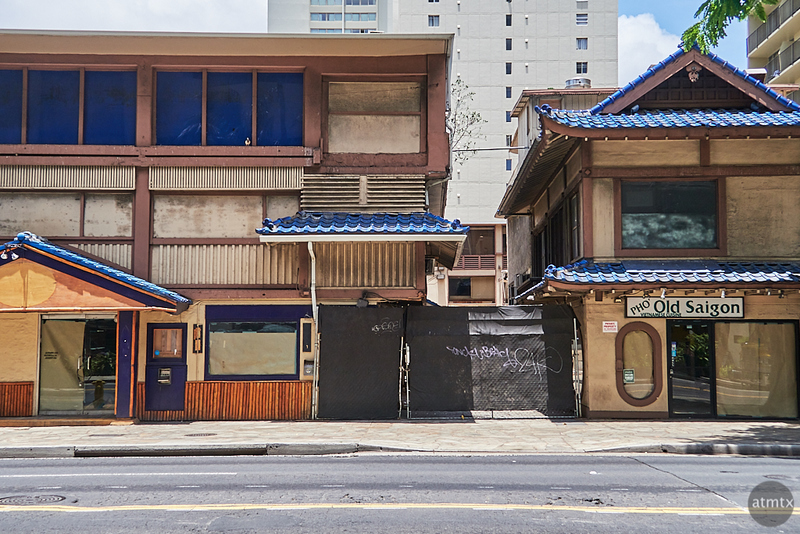 Located again on Kuhio Avenue, all of the business in these buildings are now vacated, which wasn’t the case when I last visited, two-years-ago. Located across the street from the fancy and completely re-done International Market Place, I’m assuming that this block is going to get a major makeover. I did some internet research to look for definitive development plans, but didn’t find any. I did learn however, that there was recently a shooting in this area and that some of the business attracted a “rough crowd”. It’s an area of Waikiki that I usually don’t visit, especially at night. It’s good that the troublesome after-hours places have been removed. However, on the downside, some reputable restaurants with affordable prices were also closed. The tradeoffs of gentrification, I suppose.